Family passion with global ambitions. For us, fishing and farming isn’t just a business – it’s who we are. It’s an undying family passion that began when our grandparents began fishing the waters of the Bay of Fundy six generations ago. And while times have changed, our commitment hasn’t. Like our ancestors, we’re obsessed with finding better and smarter ways to bring you the very best seafood in the world. In 1985, our family decided to take control of our own destiny by establishing Kelly Cove Salmon. 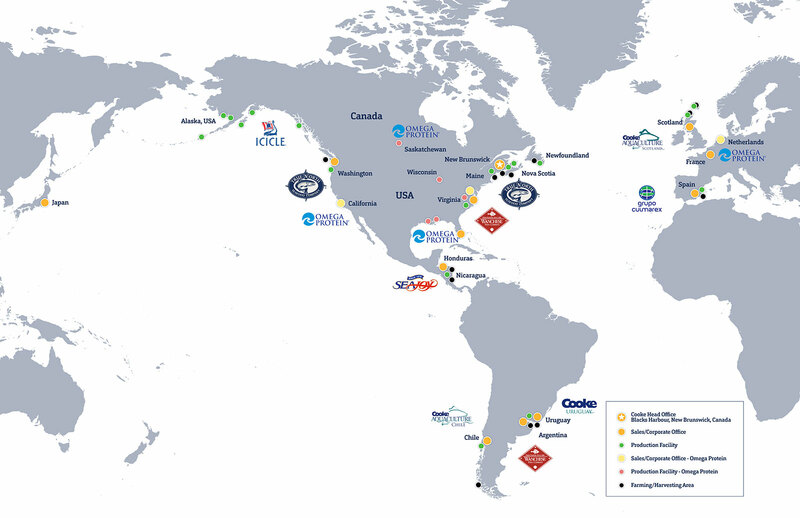 What started as a humble family aquaculture company with a single marine site has grown into a global seafood leader with fully-integrated facilities, product lines and distribution networks. In recent years, we have embarked on an aggressive plan for growth, including acquisitions and an ongoing strategic search for development opportunities. With recent acquisitions of the Wanchese Fish Company, Icicle Seafoods, Cooke Uruguay and Omega Protein, we have further diversified our product offering and expanded our seafood assets into the wild fishery. This year we acquired Seajoy Seafood Corporation Group, one of Latin America’s largest producers of premium farmed shrimp. Our secret to producing quality farm-raised salmon, wild-caught salmon, scallops, oysters, shrimp, sea bass, sea bream, crab, and other value-added products is simple. It’s a generations-old family passion and our customers can taste the difference.